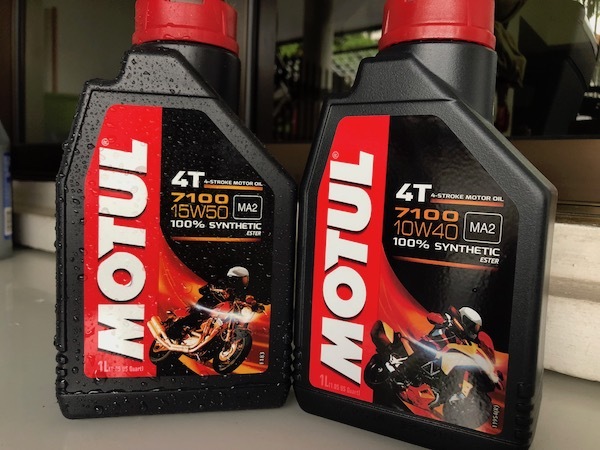 Motul 7100 4T – French or French Colony? I’ve been using Motul’s 7100 fully synthetic 4-stroke motor oils since my Pulsar riding days and have so far been pretty pleased with it. It’s reasonably priced and very readily available here in Singapore – which probably explains why its rather popular in this region. BMW calls for SAE 5W40 API SL / JASO MA2 spec’ed oil for the R1200GS wethead. And since we never experience winter in this part of the world, Motul’s 7100 10W40 API SN JASO MA2 4T oil would likely be suitable. In fact, even the BMW dealer here – PML – uses Shell’s Advance Ultra 10W40 motorcycle oil. 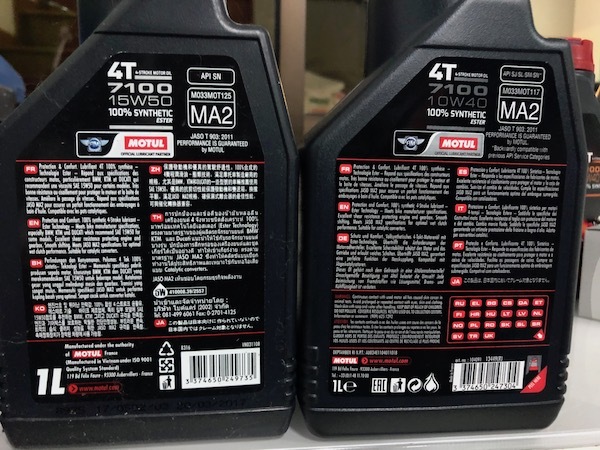 Motul 7100 – 15W50 vs 10W40 side by side. Since I had an old bottle of 15W50 with the remnant of my last DIY oil change on the Pulsar, I took it out and placed it beside the 10W40 just out of pure curiosity. Motul 7100 15W50 and 10W40 rear labels. 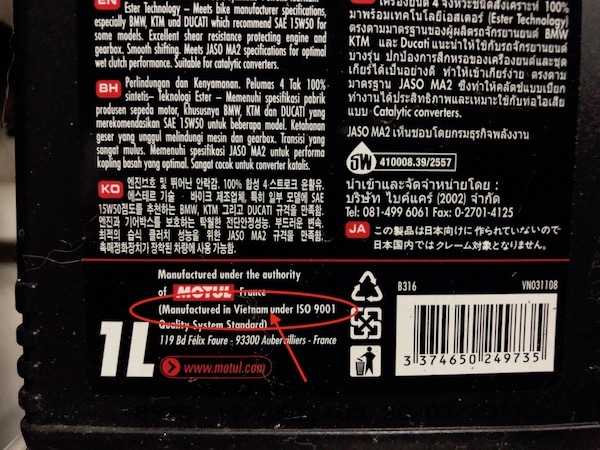 Interestingly, it was then that I realised that my bottle of Motul 7100 15W50 was manufactured in Vietnam, while the Motul 7100 10W40 was made in France! This is globalisation at work and many large companies do this – lower cost of manufacturing by locating the plant in a lower-cost country. Made in France, or made in Vietnam? I’m not suggesting that one is superior to the other, but if you’re anything like my mum – who swears by the made-in-Australia Milo and balk at the made-in-Malaysia version of the same thing (I honestly can’t tell the difference) – you might just want to take a quick peep at the rear label of that bottle of Motul oil before your next purchase. Motul 7100 15W50 – Made in Vietnam. 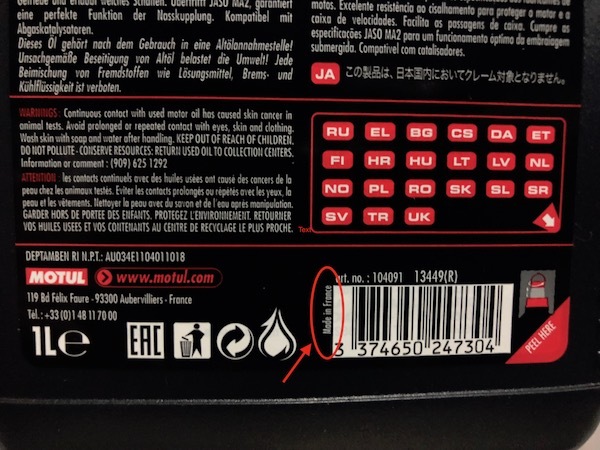 Motul 7100 10W40 – Made in France. I’ve been following your thread, and was wondering how much you paid for the motul? Per bottle? SGD21 per liter from MXTradings. this is the green colour type right ? I find the red color one ( i think its 300) much more smoother . The 300V is green, and the 7100 is red. While the 300V is reportedly “smoother” and “better for racing”, I journaled a piece on why I prefer using the 7100 over the 300V for my type of riding. i see red i happy …. There is a online seller going for $18 per bottle for 7100 made in France.